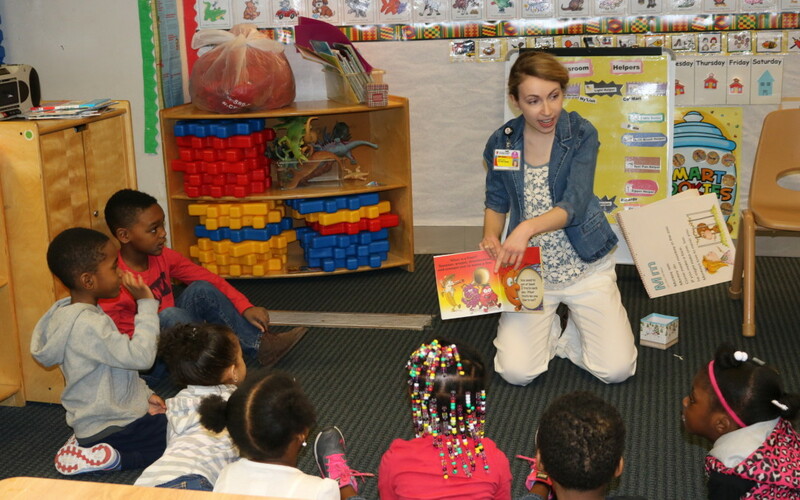 Head Start students at George Forbes Early Learning Center got a lesson in nutrition today from University Hospitals’ interns who are studying to be dietitians. 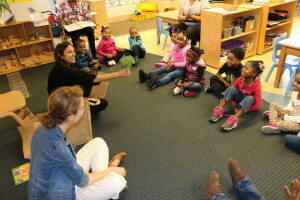 March is national nutrition month, and to celebrate, a group of five interns taught the students about the difference between fruits and vegetables, the importance of eating five fruits and veggies each day, and the health benefits that certain foods provide. The interns read books about healthy eating and played a game where the students had to guess what fruit or vegetable was in a brown paper bag without peeking. Each child received an activity book and nutrition information so they can continue learning and practicing healthy habits at home. The children loved their time with this special team. Thank you, University Hospitals! Sara Muschkin shows the students kale, a new healthy green vegetable. The kids take turns closing their eyes and feeling fruit or a vegetable in a paper bag. Then, they got to guess what was inside. The students all laughed when they saw it was broccoli – they thought it felt more like a small tree!